Beyoncé Funds College Scholarship Award For 'Bold, Creative' Women : The Record Tied to the one-year anniversary of her Lemonade project, she will be funding "Formation Scholars" at four institutions of higher learning, including two historically black colleges. 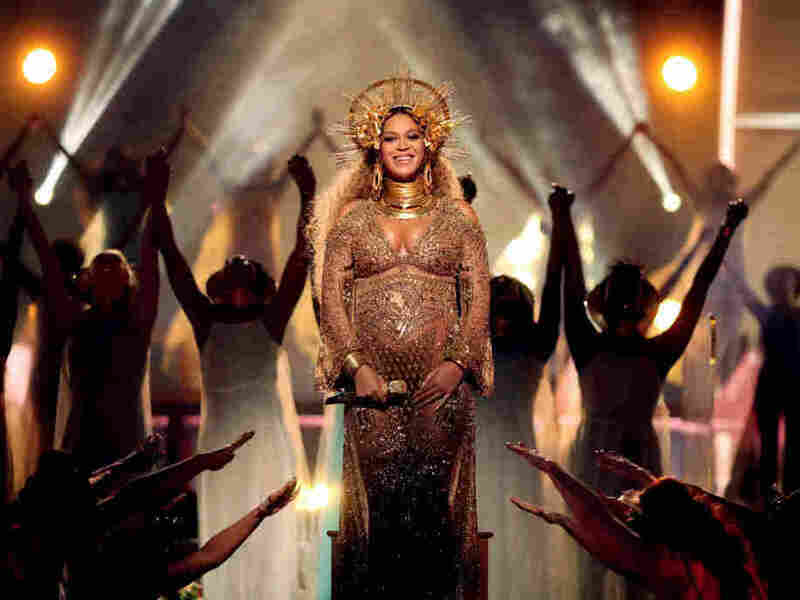 Singer Beyoncé at the Grammy Awards in February. This story was updated on April 26 at 3:00 PM. Beyoncé's "visual album" Lemonade was released a year ago this week, but its impact continues to unfold. Just last week, the project won a Peabody Award. But the singer is also focusing on making its resonance felt through a very different vehicle: a group of scholarships called the "Formation Scholars" awards. Announcing the program this morning on her website, she says that the scholarships are meant "to encourage and support young women who are unafraid to think outside the box and are bold, creative, conscious and confident." The awards specifically are geared to students studying either "creative arts," music, literature or African-American studies. There will be one recipient — either an incoming or current undergraduate or graduate student — at each of the four participating institutions: the Berklee College of Music, with campuses in Boston and Valencia, Spain; Howard University in Washington, D.C.; Parsons School of Design in New York City; and Atlanta's Spelman College. Two of the schools, Howard and Spelman, are historically black institutions; the other two are geared towards students pursuing creative careers. What was not mentioned in the singer's announcement is how much money is tied to each award — i.e., whether or not it is a full scholarship, or if it will simply offset some of the costs of attendance. A spokesperson from Berklee told NPR on Wednesday, April 26 that the scholarship is for $25,000 per school per year. By each of the four schools' own data and reporting, the costs of annual tuition, board, supplies and other fees for undergraduates range from approximately $40,000 to $70,000.